The 1998 U.S. Olympic Women's Ice Hockey Team had a powerful impact on the growth of girls' and women's hockey in the United States thanks to the success it enjoyed at the 1998 Olympic Winter Games in Nagano, Japan. The team twice defeated arch-rival Canada, including by a 3-1 count in the gold-medal game, en route to winning the first gold medal presented in women's ice hockey at an Olympic Winter Games. Behind the guidance of Head Coach Ben Smith, Team USA finished the tournament undefeated (6-0-0) and outscored its opponents, 36-8. 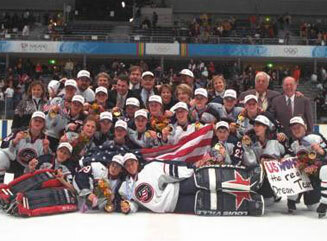 Cammi Granato, a 2008 U.S. Hockey Hall of Fame Inductee, Karyn Bye, Katie Kingand Gretchen Ulion, co-led the U.S. with eight points each, while netminders Sarah Tueting and Sara DeCosta split time in goal, each winning three games. Goaltender Sara DeCosta 1 5-9 (175) 130 (59) 05/13/77 R Warwick, R.I.
Goaltender Sarah Tueting 29 5-7 (170) 140 (64) 04/26/76 L Winnetka, Ill.
Defensemen Tara Mounsey 2 5-6 (167) 150 (68) 03/12/78 L Concord, N.H.
Defensemen Angela Ruggiero 4 5-9 (175) 175 (79) 01/03/80 R Harrison Twp., Mich.
Defensemen Colleen Coyne 5 5-3 (160) 131 (59) 09/19/71 L East Falmouth, Mass. Defensemen Sue Merz 7 5-5 (165) 145 (66) 04/10/72 L Greenwich, Conn.
Defensemen Vicki Movsessian 14 5-5 (165) 140 (64) 11/06/72 L Lexington, Mass. Defensemen Chris Bailey 24 5-6 (168) 160 (73) 02/05/72 L Marietta, N.Y. Forward Lisa Brown-Miller 3 5-1 (155) 128 (58) 11/16/66 R Union Lake, Mich. Forward Karyn Bye 6 5-8 (173) 160 (73) 05/18/71 R River Falls, Wis. Forward Laurie Baker 8 5-6 (168) 140 (64) 11/06/76 R Concord, Mass. Forward Sandra Whyte 9 5-7 (170) 130 (59) 08/24/70 R Saugus, Mass. Forward A.J. Mleczko 11 5-11 (180) 160 (73) 06/14/75 L Nantucket, Mass. Forward Alana Blahoski 18 5-7 (170) 127 (58) 04/29/74 R St. Paul, Minn. Forward Katie King 20 5-8 (173) 165 (75) 05/24/75 L Salem, N.H. Forward Gretchen Ulion 22 5-2 (157) 130 (59) 05/04/72 L Marlborough, Conn. Forward Tricia Dunn 25 5-8 (173) 142 (64) 04/25/74 L Derry, N.H.
Head Coach: Ben Smith, Gloucester, Mass. Assistant Coach: Tom Mutch, Canton, Mass. Women’s Olympic Team Chairman: Bob Allen, Lake Placid, N.Y. Team Leader: Amie Hilles, Colorado Springs, Colo.
Media Relations Manager: Kris Pleimann, Colorado Springs, Colo. Team Physician: Sandra Glasson, Virginia Beach, Va. Athletic Trainer: Jeanna Schepman, Colorado Springs, Colo.
Equipment Manager: Bob Webster, Littleton, Colo.